Firearm deaths were to blame for 52 of this year's 144 deaths. 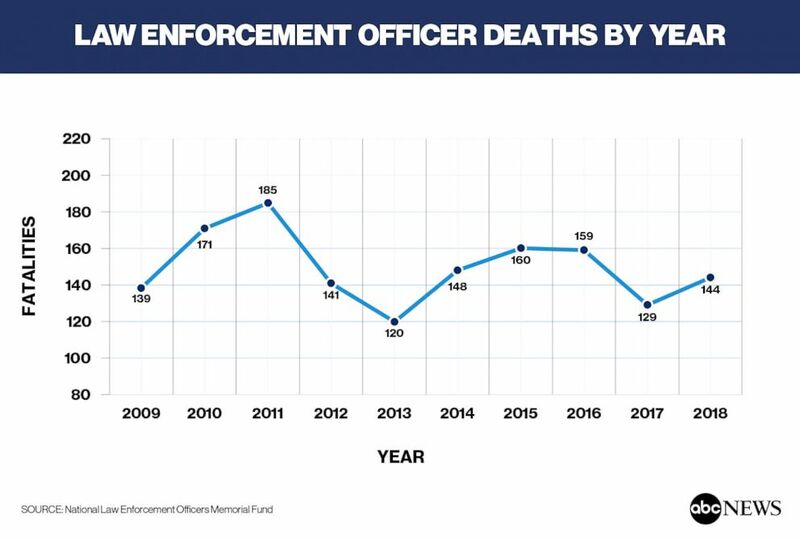 The number of law enforcement officers who died while in the line of duty went up this year, from 129 deaths in 2017 to 144 so far in 2018. 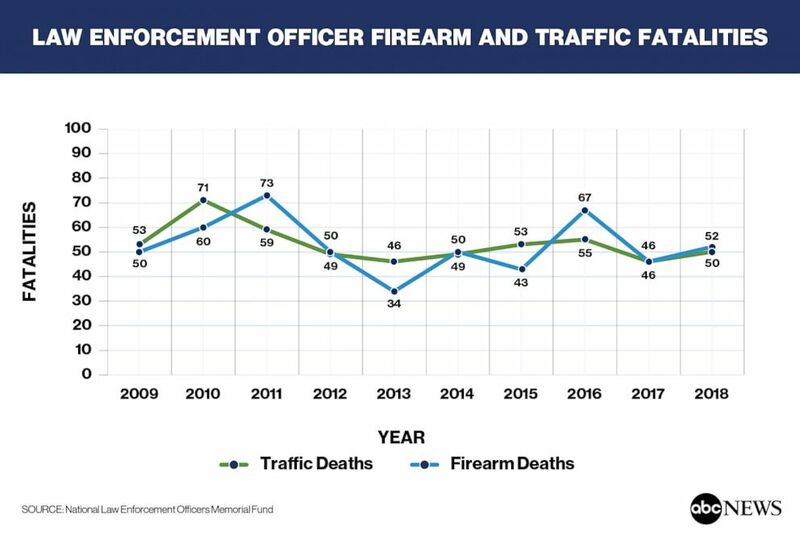 The figures, released today by the National Law Enforcement Officer's Memorial Fund, shows that the number of firearm deaths outpaced the number of traffic related deaths in 2018, with 52 officers dying because of gunshots and 50 dying as a result of a traffic incident. The 2017 fatality total marked one of the two lowest years in the past decade, and experts had been hoping that it was the start of a downward trend. "We're not surprised to see this increase, but we certainly are disheartened to see it," said Steve Groeninger, the director of communications for the Memorial Fund. "We were hoping that maybe we were on to something," he said of the dip in the 2017 numbers, "so to see all of the categories increase was disheartening." The numbers released Thursday are preliminary numbers for 2018, spanning Jan. 1 to Dec. 26 of this year, and were compared to that same period in 2017. Of the 52 firearm-related fatalities, the highest number of those -- 14 -- took place while officers were attempting to arrest an individual. The others included those killed during an investigation, in response to domestic disturbances, ambushes, during traffic stops, while transporting prisoners or responding to specific calls. Two of the firearm deaths were instances of law enforcement officers inadvertently being fatally shot by other law enforcement personnel. One of those instances stemmed from the shooting at a bar in Thousand Oaks, California, which was one of the deadliest mass shootings of the year. Sgt. Ron Helus was one of the law enforcement officers to respond to the deadly shooting, where he and 11 others were killed. It was later revealed that Helus died as a result of friendly fire during a chaotic gunfight between responding officers and the suspect. The Memorial Fund also broke down the firearms that were used in the 52 shooting fatalities, with the majority of them -- 31 -- involving a handgun. Four of the 52 shooting deaths were instances where law enforcement officers were disarmed and shot with their own weapons. The remaining 17 were with other unspecified firearms. 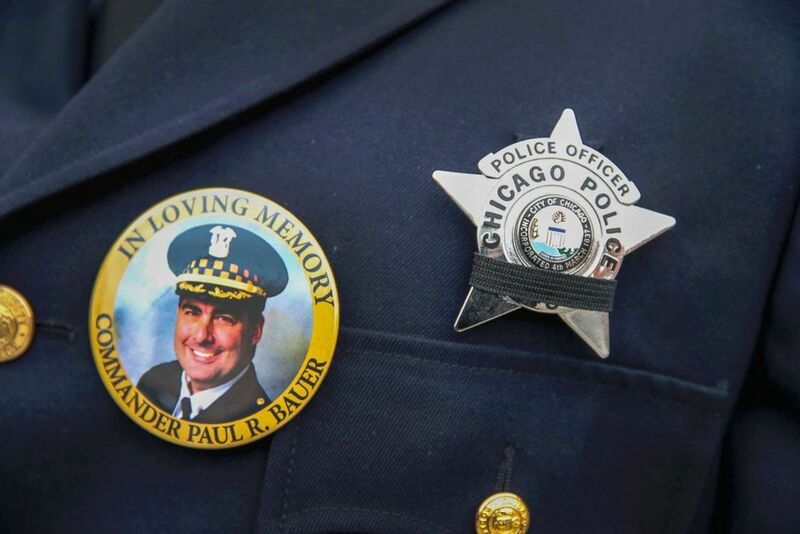 (Scott Olson/Getty Images, FILE) A photograph of Chicago police Commander Paul Bauer is seen on a pin that a Chicago police officer wears as he stands outside of the Nativity of Our Lord church in the Bridgeport neighborhood where Bauer's funeral was held Feb. 17, 2018. Of the 50 traffic-related fatalities, the majority of those -- 32 -- were killed in connection to traffic crashes. Others were struck while outside their vehicle or killed in motorcycle crashes. One such traffic crash happened just days ago, when Detective Deidre Mangedoht was killed on Christmas Eve during a traffic stop in Louisville, Kentucky. John Cohen, a former acting undersecretary at the Department of Homeland Security (DHS) and current ABC News consultant, said that "sadly" he doesn't find the increase surprising either. "Our society is more polarized. People are angry. More people are willing to use violence in response to a grievance or in furtherance of an ideological or political cause, and unfortunately that includes targeting police officers," said Cohen, who previously worked as a police officer himself. "It's hard as a law enforcement professional to view these statistics as anything but extraordinarily sad... Each of these officers had a family," he said. "For the most part, people become police officers to better our society and each one of these cases, the ultimate price was paid to do so," Cohen added.